Jump 50th Anniversary・Premium Carddass Set All Generations Ver. Jump 50th Anniversary Exclusive. Super Rare SET [9 Cards] CP SET [22 Cards] Rare SET [15 Cards] Common SET [30 Cards]. CP SET [8 Cards] Common SET [30 Cards] Super Rare SET [9 Cards] Rare SET [15 Cards]. SAMPLE SH6 FULL SET . This is an almost complete set of the Phoenix Expansion to Wyvern CCG. The missing cards are 67 Phoenix. 66 Panther. Super Rare SET [9 Cards]. Limited edition collectors tin from the Star Trek ccg card set produced by Decipher. Numbered with certificate, contains a complete silver border set of Premiere. Excellent but not sealed. Other pics are for illustration only. Common SET [30 Cards] Super Rare SET [9 Cards] Rare SET [15 Cards]. Comic/Story Notes: Complete Set of 121 Cards in Folder - BB. For sale is the complete set of common, uncommon and rare cards. Album and sleeves may have light wear. There are 2 cards per pocket. Grade: NM-MT to MT. This deck contains everything you need to play as the monstrousPredators, a checklist is below. All cards are unused and in nice condition. Predator Shuttle x 1. Ceremonial Armor x 1. Instructions are not included, but can be found online. Complete set of all 162 common and uncommon and rare cards from the Hoth Expansion of the Star Wars CCG produced by Decipher. We try our hardest not to make mistakes but we're only human and occasionally mistakes do happen. When you have fulfilled the conditions you score the card and gain sanity. In this card's case you score 8 points and gain 2 sanity. You can throw allies in front of the monsters as cannon fodder to protect your investigator. Common SET [40 Cards] Super Rare SET [8 Cards] Rare SET [24 Cards]. You will be purchasing one single complete, sealed Nodwick set from the Warlord Saga of the Storm CCG . The opened set is to show what is inside the package, the set you recieve will be sealed. I have multiple available. 2017 FINAL FANTASY TCG OPUS 3 III NON-FOIL COMPLETE SET. Final Fantasy TCG - Opus III Price Guide (PRICE CHECKED 3/05/19). You are looking at a complete set of Opus 3 with starters which is great for any collection. Star Wars CCG complete 180 card Dagobah set from Decipher. This set has a ton of great cards like Yoda, Son of Skywalker, Executor, Avenger, Bossk, Zuckuss, 4-L0M, IG-88, Dengar and more. Warhammer Invasion The Skavenblight Threat Battle Pack (RARE OOP). There are 6 battle packs in the corruption cycle to collect and the skavenblight threat is the first battle pack. It is now out of print and hard to get a hold of. This battle pack is complete with all 40 cards and the leaflet. Pack contents are in excellent condition, box shows minor signs of wear - see photos. Item will be posted 1st class signed for (2nd class signed was the only option on the listing for some reason). These cards went straight from the booster or deck and into storage. They have never been used. This is for a collection of unplayed or slightly played commons and uncommons from the Onslaught block. Legion: Root Sliver (u); Shifting Sliver (u); Wirewood Channeler (u). 2018 FINAL FANTASY TCG OPUS 4 NON-FOIL COMPLETE SET. Final Fantasy TCG - Opus IV Price Guide (Updated 2/11/19). You are looking at a complete set of Opus 4 which is great for any collection. I have always stated that it is mathematically impossible to pull an entire set from one box. 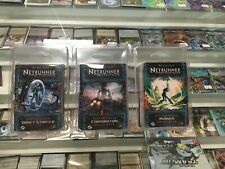 Final Fantasy TCG Opus 7 VII Non-Foil Commons and Rares Playset. You are looking at a complete commons and rares playset of Opus 7 which is great for any collection. Buying singles online will increase costs so get a playset first and add later. PREMIERE LIMITED BLACK BORDERED - COMPLETE COMMON AND UNCOMMON SET (216 CARDS). General Carlist Rieekan. A full list below Wes Janson. Rogue 2 x2. Rogue 3 x3. Surface Defense Cannon. Major Bren Derlin. Tactical Support.